We enjoy sunrises and sunsets as the earth spins and carries us into and out of the sun’s light. If you lived on the moon, which spins more slowly than the earth, there would be two weeks of daylight and two weeks of night! 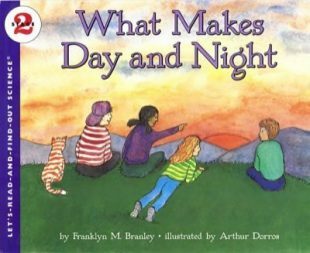 This book explains in clear, easily understood language and with a simple experiment to demonstrate, what makes day and night. I had heard that the earth’s spinning and the effects of the sun’s rays cause day and night before reading the manuscript for this book. But it is another thing to really be able to picture all that. Franklyn Branley’s clear explanation gave me new understanding of the earth’s turning and how we turn with it. Besides, the text gave me opportunities to envision what it would be like to see the earth from space and what it might be like to spend a little time there– one month on the moon to go through a single cycle of dark and light. I have renewed appreciation for sunsets and sunrises.